Stacks, Rotators, SteppIR or UltraBeam antennas, Automatic Amplifiers, and other devices. Station Master DeLuxe™ is big brother of regular Station Master™ and has all its capabilities but provides more ergonomic user interface with large LCD, a lot of buttons and stacked antenna support. Station Master DeLuxe is designed for large single radio stations with multiple rotators and stacks, advanced SO2R stations requiring full control and ergonomic setup for each radio position, and all multi radio setups. The thing that makes Station Master DeLuxe (SMD) really different, is proprietary network operation. 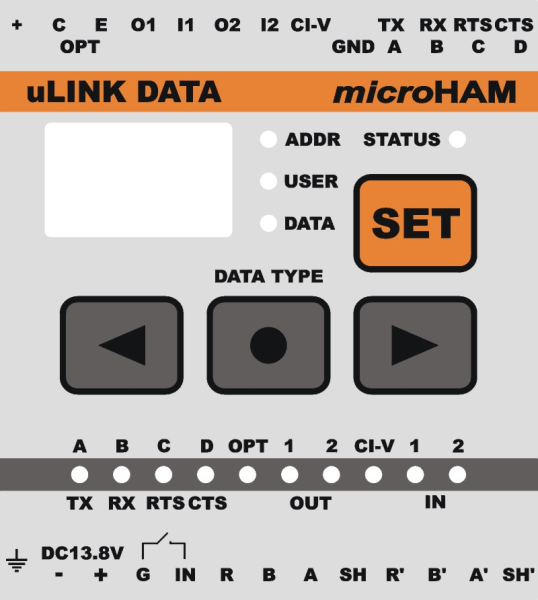 Multiple SMD units can be linked over a reliable, low latency "uLink" bus (RS-485) independent of the computer LAN network. The uLINK bus supports up to 31 SMDs (15 SO2R operating positions or 31 single radio operating positions). Each linked SMD can simultaneously control up to 128 uLink modules, boxes expanding control capabilities. The total length of the uLINK bus can be up to 1.2km (4000ft) using CAT5 cable – enough to comfortably link a complete multi-radio station including the antenna farm. The uLINK modules are small, remote, dedicated function boxes - relay outputs module, RS232 port module, rotator control module, and stepper motor module, to control devices like antenna switches, stack switches, receive antennas switch boxes, rotator controllers, motors, matching networks, and more. Station Master Deluxe includes a safe, user configurable system of priorities and lockouts which allows sharing final devices by multiple stations without collisions and damage. Fully stand alone operation, independent of the computer and LAN. Compatible with all microHAM "keyers". Advanced integration with MKII and MK2R+. Maintains three antenna paths for each radio, separately for main and sub receivers as well as for TX. Support for stacked antennas including complex stacking topologies (e.g., stacked stacks). Intelligent rotator control including parallel control of multiple rotators, automatic sequenced control of rotators on the same tower, rotator over rotator, or rotator on rotary tower installations. Forget impossible, exploit technology advantage! 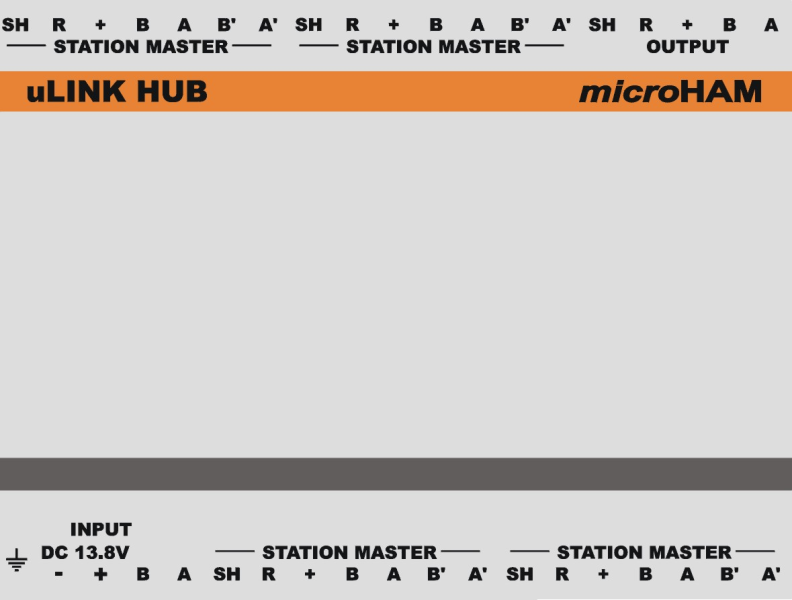 Station Master DeLuxe™, miniDIN 6 to miniDIN 6 cable, RCA to RCA cable, coaxial 2.1/5.5mm power plug and CD-ROM containing microHAM USB Device Router and documentation. uLINK HUB™, two terminals, two bus terminators. Package contains: uLINK RELAY10™, two terminals. Package contains: uLINK RELAY6™, two terminals. Package contains: uLINK DATA™, two terminals. Package contains: uLINK ROTATOR™, two terminals.